University of Chicago Press, 9780226610252, 304pp. If the twentieth century saw the rise of “Big Science,” then the seventeenth and eighteenth centuries were surely an age of thrift. As Simon Werrett’s new history shows, frugal early modern experimenters transformed their homes into laboratories as they recycled, repurposed, repaired, and reused their material possessions to learn about the natural world. 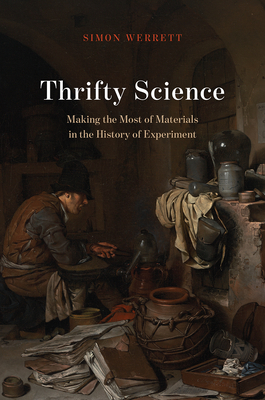 Thrifty Science explores this distinctive culture of experiment and demonstrates how the values of the household helped to shape an array of experimental inquiries, ranging from esoteric investigations of glowworms and sour beer to famous experiments such as Benjamin Franklin’s use of a kite to show lightning was electrical and Isaac Newton’s investigations of color using prisms. Tracing the diverse ways that men and women put their material possessions into the service of experiment, Werrett offers a history of practices of recycling and repurposing that are often assumed to be more recent in origin. This thriving domestic culture of inquiry was eclipsed by new forms of experimental culture in the nineteenth century, however, culminating in the resource-hungry science of the twentieth. Could thrifty science be making a comeback today, as scientists grapple with the need to make their research more environmentally sustainable? Simon Werrett is a senior lecturer in history of science in the Department of Science and Technology Studies at University College London. "Many students of science spend a fair bit of time learning about the theorists and experimentalists of the seventeenth and eighteenth centuries. Yet it can be hard to picture these figures through the layers of historical scholarship and popular accounts. . . . Simon Werrett's Thrifty Science is, among other things, a lively attempt to show another side of these figures and their era." "Simon Werrett’s sprightly book documents the importance of repair, reuse, and recycling in early-modern science. By examining how materials and apparatus were continuously adapted for new uses, he shows how scientific experiment was part of domestic oeconomy. He has foraged widely in textual, visual, and material evidence to recover a history that has been largely forgotten in our age of throwaway consumption. The book will appeal both to historians and to those who are concerned about the sustainability of today’s scientific practices."